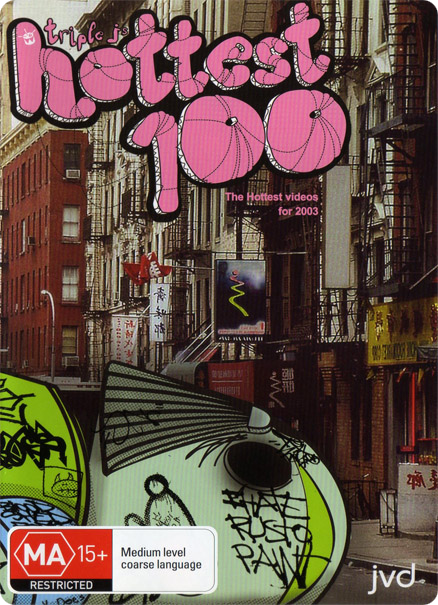 The 2003 Hottest 100 DVD was released on April 19th, 2004 and was the second time that a DVD was released in addition to the normal CD compilation. While many videos differ from the original tune that they are created to accompany, it's worth noting the following. The Mars Volta's 'Inertiatic ESP' video begins with a long instrumental, which is actually called 'Son et Lumière'. This instrumental serves as an introduction to the album and 'Inertiatic ESP' itself on the band's album 'De-Loused In The Comatorium'. Pete Murray's 'Feeler' video has no official video, and as such, the included clip is a live performance of the song. This is an odd choice considering that the other Pete Murray track to make the countdown, 'Lines', did in fact have an official music video that was released in time for inclusion on the DVD.